A loco moco, one of the interesting foods to try in Hawaii. No list of foods to try in Hawaii would be complete without the iconic loco moco. A power-packed bowl of protein and carbohydrates, this dish is a favorite among locals and visitors alike. 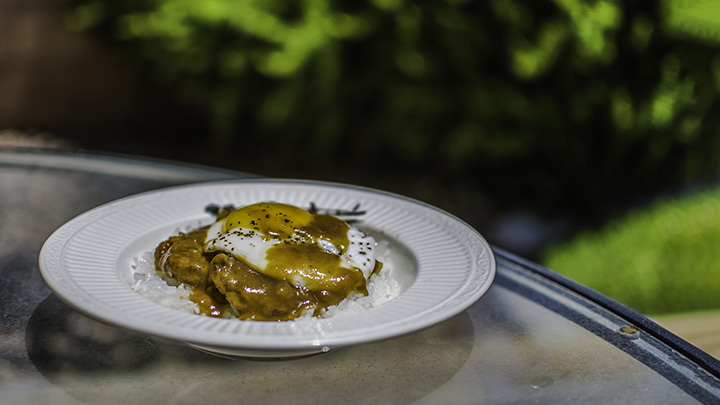 The loco moco typically comes in a bowl of rice, topped with a hamburger patty and a fried egg, smothered with brown gravy. 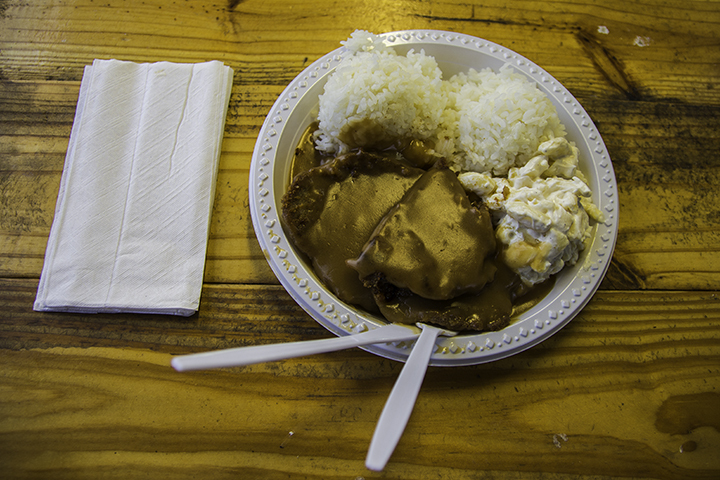 The most important staple of Hawaiian culture, you will always find poi in Hawaiian food establishments. Poi is made from the fermented mash of the taro root. Some eat this pudding-like food with sugar and milk. But traditionalists will always eat it plain. Taro has many health benefits. This is because it comes with vitamins A and B-complex, thiamin, riboflavin, zinc, magnesium, copper, potassium, fiber and iron, As a result, parent often serve poi to babies in the Aloha State. Hawaii’s love of Spam dates to World War II when it was the primary source of protein for many residents. This is because the military monopolized supplies of fresh meat for the troops. Since then, Hawaii has taken it to new levels in the form of the Spam musubi. Musubi is the Japanese name for rice ball. 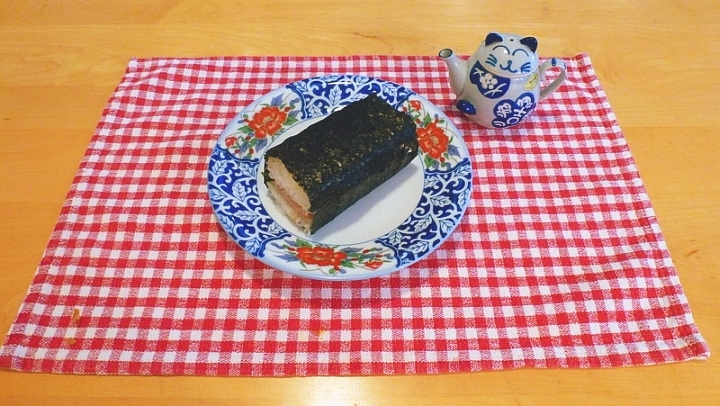 But in the case of a Spam musubi, a rectangular mold of rice has a slice of Spam wrapped onto it with nori. Nori is a Japanese dried, pressed sheet of roasted seaweed. One can even jazz up Spam musubi by cooking the Spam in teriyaki sauce and is a great meal for people on the go. The famous Hawaiian kalua pig is always the main entrée at a luau, a traditional Hawaiian feast. Cooked traditionally, one roasts an entire pig in an underground Hawaiian pit or imu. Then you wrap it in banana leaves until the meat is moist, savory and easy to shred by hand. Even if you don’t attend a luau, make sure to include kalua pig as one of the foods to try in Hawaii. For those who like raw fish, poke may become one of your favorite foods in the Aloha State. Although many may have their own take on it, one typically makes poke from chunks of raw tuna. Usually, it’s either ahi (yellowfin tuna) or aku (skipjack tuna). Then you mixed it with ogo, (a local seaweed), slices of sweet Maui onions, inamona (the meat of the kukui nut), chili peppers and soy sauce. This is a standard dish served in places that specialize in Hawaiian foods. Lomi salmon is somewhat unique as a Hawaiian food dish in that its main ingredients—salted salmon, onions and tomatoes—are not truly native to Hawaii. Despite that, many consider this is dish as authentically Hawaiian as can be. Although this may not be the healthiest item, the plate lunch is the ultimate gut-busting comfort food. A typical plate lunch will include two scoops of white rice, macaroni salad and a wide range of heavy duty proteins. Options include: teriyaki beef, pork cutlet, chicken katsu, chili with franks and more. For the diet conscious, in some places you can even substitute the macaroni salad for a tossed salad. Soft and delicate, these delicious pastries are similar to donuts, but without the holes and are lighter and sweeter. Excellent as a dessert or morning starter, malasadas trace their roots from the Portuguese immigrants. The delectable deep-fried malasadas can also be filled with coconut cream, mango or lilikoi fillings. But whether you go with the plain or ones with fillings, this treat is a winner. Traditionally the dessert served at Hawaiian luaus, haupia is a coconut-lover’s delight. Sweet and simple, the haupia is a custard-like dessert made from coconut milk mixed with ground pia root or corn starch. Haupia is typically served in cut squares and is a nice light finish to any robust Hawaiian dinner. 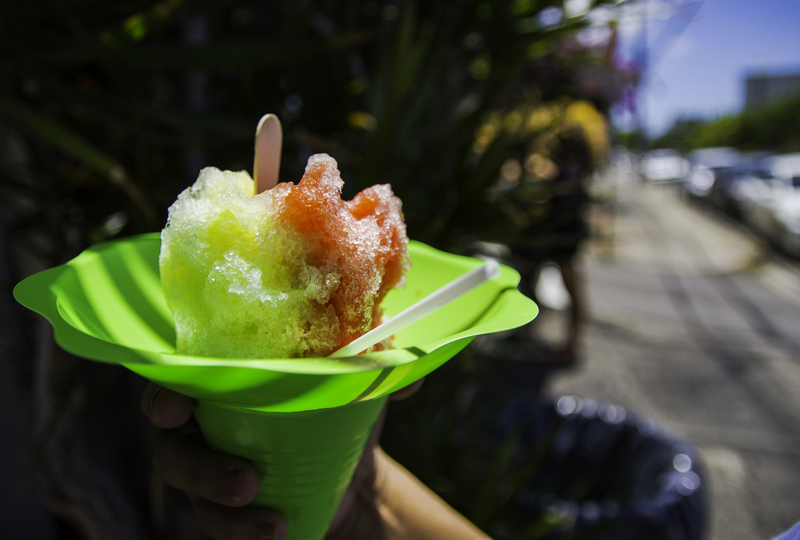 Last but definitely not least, shave ice might arguably be the most popular dessert in the islands. Famous across the world, Hawaiian shave ice uses finely shaved, not crushed, ice and infused with sweet syrups. They range from the classic strawberry to an amazingly wide range of exotic flavors, such as coconut, lilikoi and kiwi. You can also add sweet azuki beans, ice cream and even condensed milk. So definitely put this on your list of foods to try in Hawaii.